Yitzhak Rabin, a "martyr for peace," was buried Monday after eulogies by world leaders, including Arabs, who promised that efforts to end religious and ethnic bloodshed in the Mideast would carry on despite the assassination of the Israeli prime minister. The man who confessed to killing Israeli Prime Minister Yitzhak Rabin appeared in court for the first time Monday. Jewish law student Yigal Amir told the judge the assassination was meant to halt the Mideast peace process. Syria, officially silent immediately after the assassination of Israeli Prime Minister Yitzhak Rabin, has now condemned the killing. The assassination of Prime Minister Yitzhak Rabin casts a dramatic new light on Arab-Israeli peace talks. 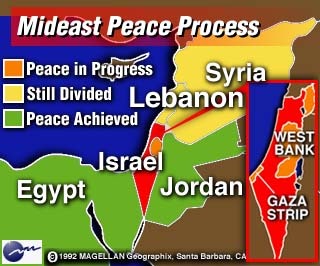 Over the past four years, Rabin successfully had reached accords with the Palestinians and with Jordan, and in one of his last face-to-face meetings with journalists, Rabin told CNN less than a week ago that he was determined to go ahead with negotiations with Syria. How could Israel's fabled secret service fail to protect Rabin? External sites are not necessarily endorsed by CNN Interactive.